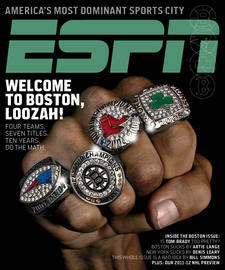 Sweet rings, sweet cover about Boston's winnahs, and sweet distraction from the submerging Red Sox. Or as Kevin Garnett put it in a classic commercial for ESPN Mag back in the day before he was part of the Boston sports scene, it's tastefully done. 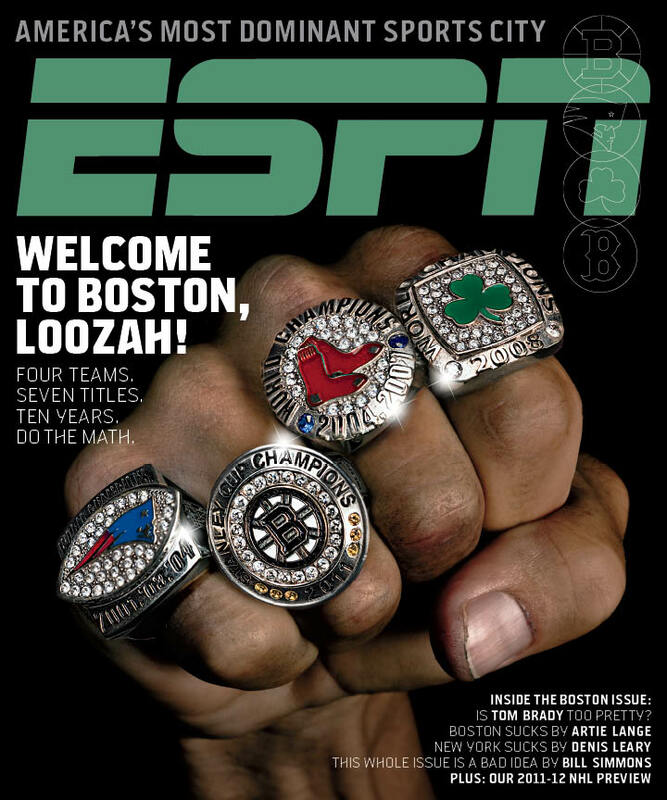 While the suspicion here is that this week's all-Boston issue will include more references to "Beantown'' than most true Bostonians would ever actually say -- that would be one or greater -- a glimpse at the table of contents suggests it should be appealing overall even to the most parochial Boston fan. Hey, anything with an article about Boston sports titled "Decade of Dominance" is off to a good start as far as I'm concerned. Also, Bill Simmons -- Grantland Sports Guy these days -- returns to the magazine to write a back-page piece on why the issue was a bad idea. The Front Office Diaries -- A look inside the thinking of the Red Sox farm system featuring the scouting reports on some of the team’s best homegrown players, such as Dustin Pedroia, Jacoby Ellsbury, Clay Buchholz, and Jonathan Papelbon. Sounds like required reading for those howling without context or a clue that Theo Epstein should be fired. How to Rob Fenway Park -- Chuck Hogan’s novel “Prince of Thieves” was turned into “The Town,” a well-reviewed and wholly Boston movie directed by and starring Ben Affleck. (Jeremy Renner, a Modesto, California native, had the most accurate Boston accent in the movie, however.) Following the movie’s release, there was a string of copycat bank and armed car robberies utilizing techniques seen in the movie. But no one has tried to copy the film’s heist of Fenway Park -- yet. Other than perhaps John Lackey every fifth day. Bruins in the Bean -- This photo essay will show why the Stanley Cup champion Bruins are the most Bostonian of all the pro athletes in the Hub, with vignettes of their daily lives and what they love about Boston. No wisecrack here. Could not agree more with the premise. Debating Boston -- Artie Lange (a Yankees fan) and Denis Leary face off to argue that Boston’s sports teams are awful and amazing, respectively. Then they rip apart the other’s view. Kudos to ESPN for going with two legitimately funny personalities to rep the two fan bases rather than, say, Billy Crystal and Lenny Clarke. Who Does Tom Brady Think He Is? -- An examination of why Tom Brady is hard to relate to and "insufferable." Presumably co-bylined by Terrell Suggs and Bridget Moynahan. Regarding that last article, I'm going to do what Brady does so well: pass. But I am looking forward to checking the issue out. It should arrive in subscribers' mail boxes today or tomorrow and is available on the newsstand Friday.